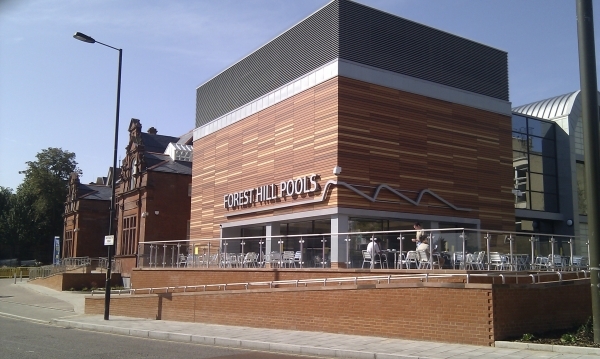 Forest Hill Society: POOLS ‘TOPPED OUT’! Our years of campaigning are now visibly evident. 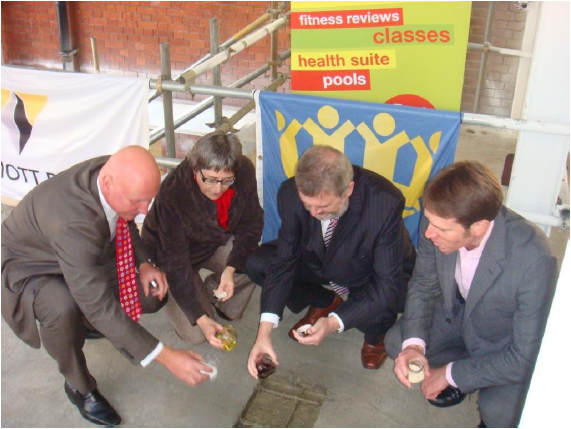 On 28 October Forest Hill’s new pools were ‘topped out’ at a ceremony to mark the end of the main construction phase. The Society was invited to attend as a member of the Stakeholder Group. In a somewhat pagan ritual, Steve Bullock, our Mayor, Councillor Chris Best, Lewisham Cabinet Member for Community Services, Mark Tant, MD of builders Willmott Dixon and Ivan Parkinson, Finance Director of Fusion, poured salt, oil, water and corn into a carefully prepared recess in the concrete upper floor of the building. We were assured that the offerings would be removed prior to filling the recess in order to ensure structural integrity. 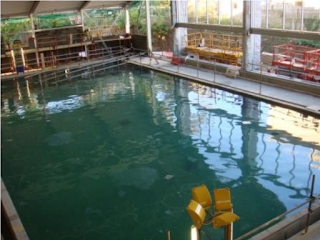 We were surprised to find both of the new pools full of water – apparently this was to test for leaks. At a subsequent meeting of the Stakeholder Group, we were shown all the surface finishes that were to be used in the building. 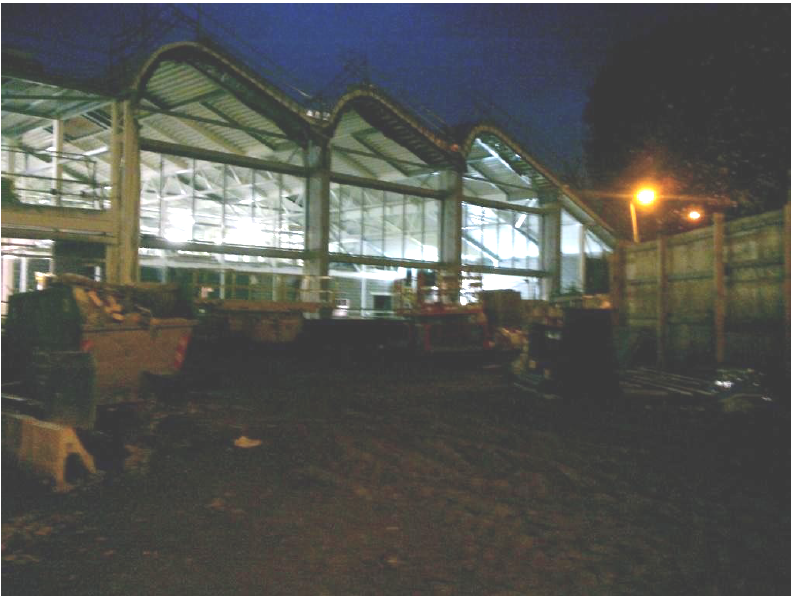 The main pools hall will largely be finished in a traditional pale blue colour with white tiling in the pool and dark blue lane markings. The stakeholder group had a presentation from Fusion about their management plans for Lewisham‘s leisure facilities in general, and Forest Hill in particular. 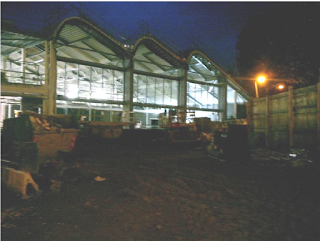 As a company which is also a registered charity they are committed to returning any profits they make to the benefit of the sporting facilities they manage. They have considerable experience of managing local leisure facilities including Brockwell Lido, Dulwich Baths and Peckham Pulse. 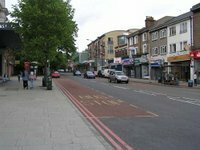 With a 15 year contract to manage most of Lewisham‘s facilities, they will be looking after more than 50 facilities in the area.